If you’ve already checked out our original shortlist of great classic cars for young drivers, and not found anything that appeals, this follow-up list may just get your juices flowing. All of these cars are readily available and cheap to buy, and as with the previous list, corrosion is the key problem for all of them. So you can take that for granted before you delve into the list of key buying checks. The Austin Metro was meant to replace the original Mini, but it just didn’t have the personality to do so. What it does have however is way more practicality thanks to the bigger bodyshell and hatchback configuration. Unfortunately the Metro could rot just as badly as the Mini though… A major facelift in 1990 brought a new engine and different suspension, plus an overhauled bodyshell; the earlier cars are more characterful, but the later cars are arguably more usable. An automatic gearbox was available, but these transmissions are weak, and costly to rebuild. The Hydragas suspension works differently from most cars. It’s reliable, but needs specialist attention. The A-Series engine fitted to all cars is strong enough, but you can take oil leaks for granted. An all-new 500 has just arrived, but it’s nowhere near as funky as the original, which just oozes stylish charm. The problem is, the first 500 arrived 50 years ago, so it’s slow, cramped and unrefined – so not much fun for those motorway journeys. There’s no synchromesh on the gears, while the gearchange linkage goes out of adjustment. The front suspension uses kingpins, which wear if they’re not greased regularly. 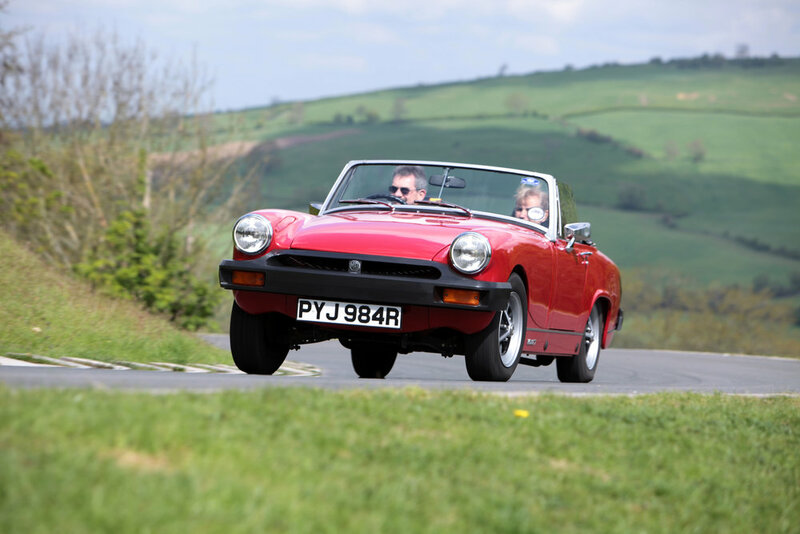 The MG Midget was always synonymous with cheap open-topped fun, and that’s still the case more than half a century after the car first went on sale. Small engines mean performance and running costs aren’t on the high side, while the club and specialist support are second to none. Plus there are plenty about – but watch out for dodgy restorations. The 1275cc engine is prone to blown head gaskets, along with worn piston rings and cylinder bores. The 1493cc engine suffers from worn piston rings, while the crankshaft wears too, so watch for low oil pressure. The single master cylinder controls the brakes and clutch. Wear is inevitable, and replacements are costly. Popular with driving schools when new, thanks to the great visibility and light controls, the Herald is cheap to buy and run and easy to get parts for. There was a choice of saloon, coupé, estate or convertible models, all of which are cheap, some of which are getting very scarce. Early cars got a breathless 948cc engine; the later 1147cc unit is stronger but the 1296cc lump in the 13/60 is the best of all. The engines are all simple, easy to maintain and durable enough, so just make the standard checks for wear. Transmissions can be weak, with the gearbox and diff wearing and getting noisy. Listen for whining. The front suspension should be oiled (not greased) every year. If this isn’t done, it will eventually collapse. The original Beetle was so cool, Volkswagen reinvented it for the 21st century. But the original is still the best in many ways, not least of all if you want to boost your social life; this is the ultimate young driver’s car for those keen to make some new mates. Easy to work on, parts availability is superb, but be careful of over-priced rotboxes. A lot of Beetles have modified bodywork, trim and mechanicals. Check any mods have been done properly. Until 1967 there was a 6-volt electrical system, but it’s possible to convert to 12-volt easily enough. A lot of Beetles have been converted from left to right-hand drive – and it’s not always done very well.